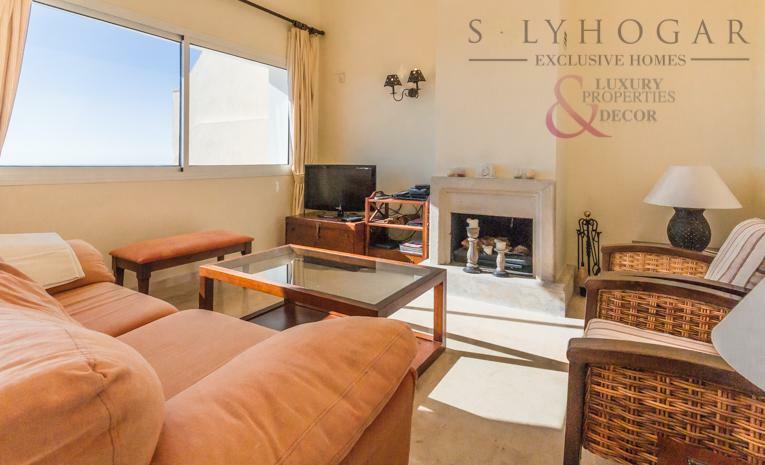 Exclusive penthouse with 2 bedrooms and 2 bathrooms located in the prestigious area of Riviera del Sol in Mijas Costa, near the famous golf course of Miraflores. 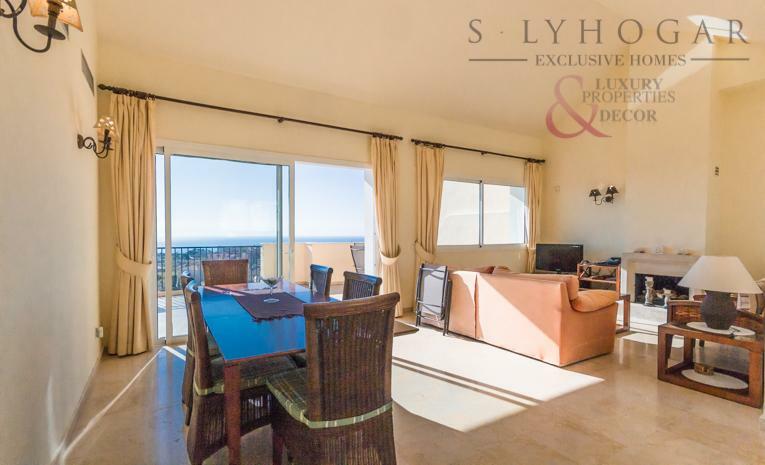 In addition to the bedrooms, it has a spacious living room with fireplace, independent kitchen and 2 terraces, the main one of about 80 m2 offers incomparable sea front views. This property of more than 130 m2 is sold with two parking spaces and a large storage room and is located in a luxury urbanization 10 mn from Marbella, 20 mn from Malaga International Airport and 5mn from the beach and all services and amenities. Jardines de las Lagunas is a project which will captivate you with its ambitious architectural design and functionality. Its community areas represent the ideal space for relaxation and pleasure, guaranteeing, at the same time, the privacy you seek. This residential complex consists of 124 apartments with 1, 2 and 3 bedrooms and penthouses with spacious terraces offering nice views over the surrounding area. The communal areas include swimming pool and private parking. Jardines de las Lagunas is situated in a fantastic location, (near Miramar Shopping Centre, El Corte Inglés, Miramar Commercial Park), with new and fantastic recreational areas (Parque Periurbano), quick access to the A7 and AP7 motorways, as well as a variety of offers on golf courses. 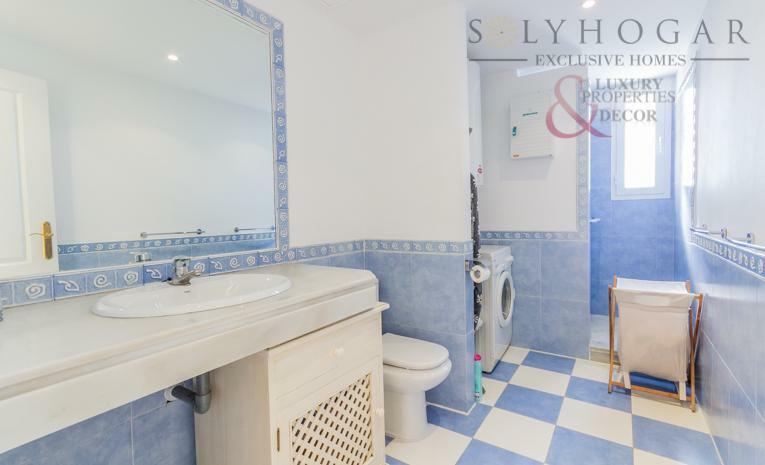 Spacious two bedroom apartment with a full bathroom. The apartment consists of a fully equipped kitchen. Very spacious and bright dining room. Located on the second floor the terrace offers us spectacular views where we can appreciate the green areas and the community pool. The property has an elevator, air conditioning and electric heating. It is sold fully furnished and equipped. Sunny townhouse, semi-furnished, south facing. It consists of two floors: Main entrance, large living room with cozy fireplace, dining room, fully fitted and equipped kitchen, guest toilet, covered terrace with barbecue area and private pool. On the upper floor, master bedroom with air conditioning and full en-suite bathroom, two spacious bedrooms, full bathroom in the hallway. Terrace of approximately 25 m2 overlooking the pool. Spectacular luxury villa completely furnished 5 bedrooms and 5 bathrooms. 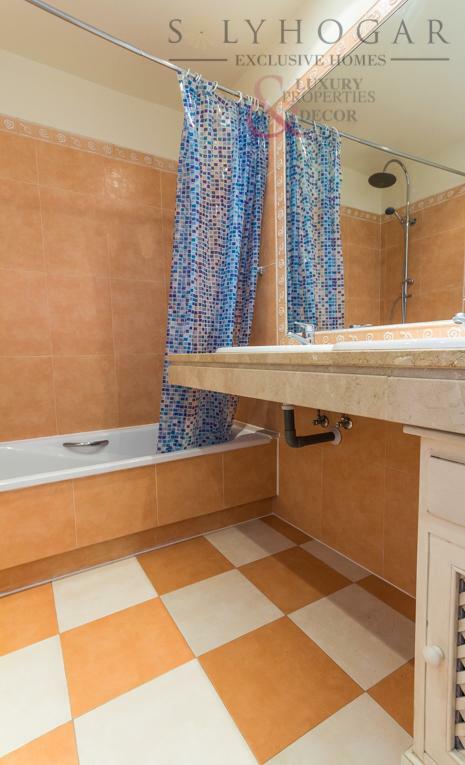 Each bedroom has a private bathroom. Large living room. Garage and storage. Fitness center. Large private pool. Additional bathroom nearby. Terraces 2 spectacular porches. Secured and very well maintained area. Amazing views. Alam in all the property. Close to all services and amenities. 3km to the beach. Plot of unbeatable location, with 843 m2 and 70% buildable. Ideal place to build a villa, a hotel or a small supermarket, with perfect access to the A7, very close to Miraflores Golf and with panoramic views of the Mediterranean Sea. Excellent Villa for sale just 2 min drive from La Cala de Mijas.The villa consists of 3 large bedrooms, 3 bathrooms, 250m2 built, very large plot and open sea and mountains views. Can be renovated with a very small budget.Great investment opportunity! For sale incredible Nazarie style villa of 400m2 built and plot of 800m2, 7 bedrooms, 3 bathrooms, 3 living rooms, covered parking of 100m2 for several cars.It has large gardens, pool, large terraces with open views. Just 400 meters from the sea and just 2 minutes drive to La Cala De Mijas.The property is in unbeatable condition, built entirely with materials of the highest quality. 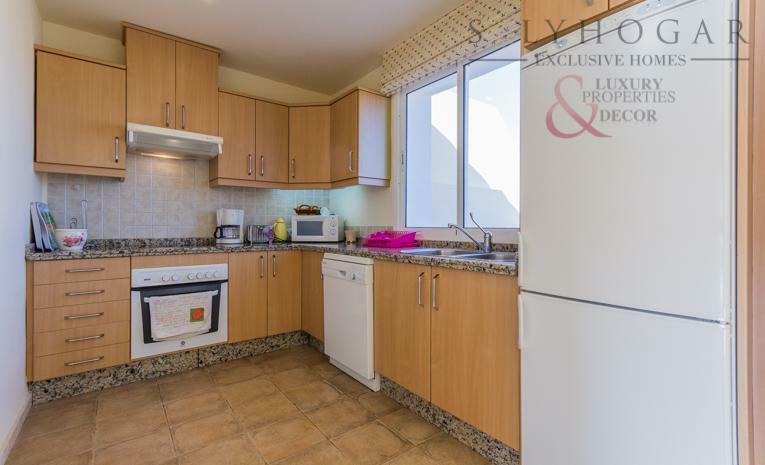 Beautiful apartment located in a sought after area in Calahonda, near the tennis club. 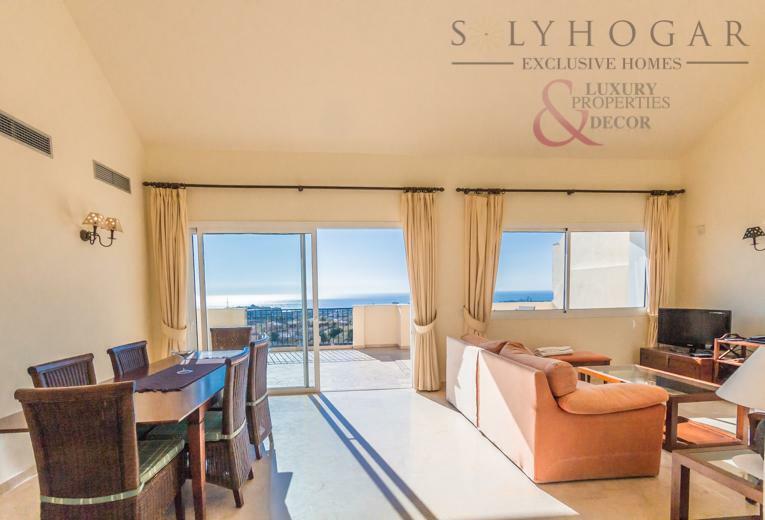 The apartment has two large exterior bedrooms with terraces and fitted wardrobes, 2 bathrooms, one of them en suite with the master bedroom, a large living room with fireplace and access to one of the three south facing terraces with views to the sea. In the urbanization there are two swimming pools one outdoors surrounded by beautiful gardens and another heated deck. Ideal apartment to enjoy all year round, both for its good qualities and its location. Do not wait any longer and call us now! You&apos;ll love it. This project is located in a private community in an excellent location in Mijas with sea and mountains panoramic views. 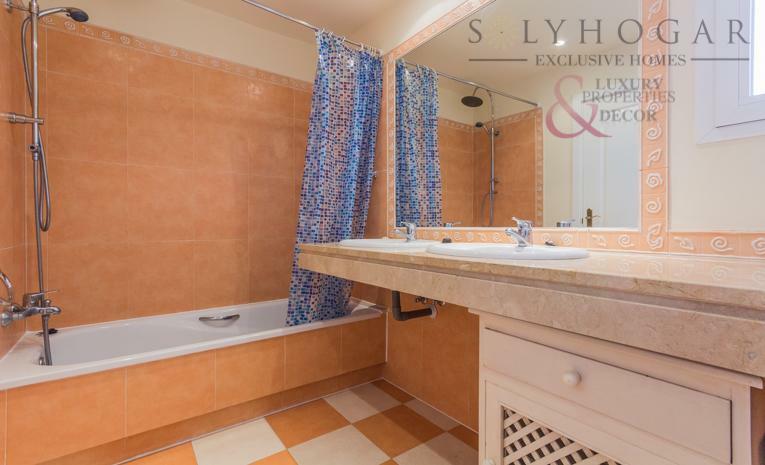 Near to the commercial area of El Higueron and less than 15 minutes driving to Malaga International Airport, a perfect location to own a luxury contemporary boutique villa. This new 26 villas development will start construction in Autumn 2017 situated on various plots from 500 - 900 sqm with different designs within the modern and open space contemporary villas from 264 - 393 sqm depending on the model and plot. Our selection of magnificent villas offers a contemporary design using eco-friendly sustainable, high quality materials and they will come with a high level of energy efficiency. These villas are situated in stunning landscape in La Cala just minutes away from a fabulous choice of beaches, golf courses, entertainment, services and natural scenery at the heart of the Costa del Sol. La Cala is just 20 minutes from Marbella and Puerto Banús and just 30 minutes from Málaga’s international airport. The residential development comprising 33 detached contemporary villas with 24h security. The plots are between 1200m² and 1600m² and they come with 3,4,5 and 6 bedrooms. They have fully landscaped gardens with 30m² carport, private swimming pool and the communal area has a Clubhouse and fully equipped gym with heated indoor pool, jacuzzi, sauna and lounge areas. A unique new development of 1, 2 and 3 bedroom apartments and penthouses located in La Cala de Mijas, between the sea and the mountains. The view from here is spectacular, overlooking Calanova golf course and further to the Mediterranean. Turn around and you can look in the direction of the snowy Sierra Nevada. With La Cala and Calahonda on your doorstep with shops, restaurants etc., the development is in the ideal location. The architecture of La Cala Hills is a modern Mediterranean style blended well with the surrounding gardens and golf courses. Private underground parking, large storage room, security, three swimming pools, sauna, jacuzzi and fitness facilities. By one of the pools you will find a cocktail / snack bar in the high season. Land of 6000 m2, with little house of 40 m2, with kitchen and shower room, 50 m2 porch with B.B.Q, It has 150 avocados, installation of drip irrigation, with production of about 6000 € per year. In the area of Entrerrios, a haven of peace, the ideal place to rest. It has a cistern of 30,000 l, water and electricity from the network. It is 15 minutes from the center of Fuengirola and 10 minutes from La Cala. 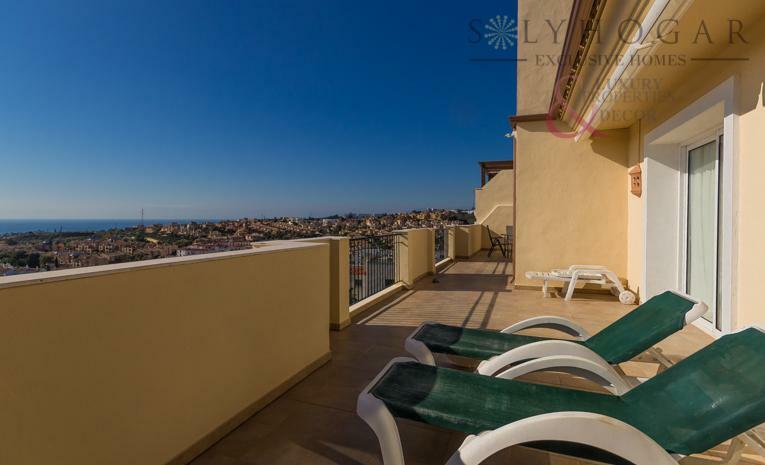 Two bedroom apartment in the Eden Golf Urbanization, Riviera del Sol. Closed urbanization with beautiful gardens, two swimming pools, paddel courts. 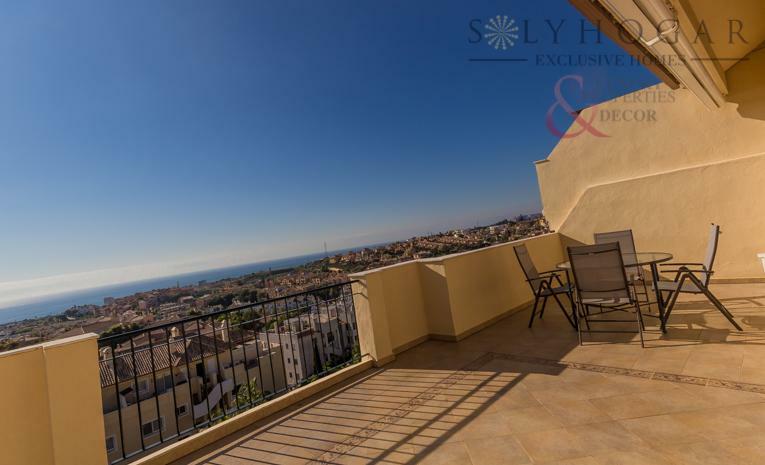 Spacious and bright apartment with beautiful terrace, the ideal place to live or vacation, right in the center of the coast from the sun 15 km from the fabulous Marbella and 15 km from the lively Fuengirola. Villa of 3 bedrooms, 2 bathrooms, large living room with fireplace garden with wooden pool house and large porch next to it. Located in a great urbanization as it is the Sierrezuela, being this one of the most relaxing areas of the whole coast.